In the built environment you will find us at the intersection of risks to wellbeing, and global concerns for sustainability. In that place our people find meaningful work, leading to mutual relationships with our customers. Our customers rely on us to manage risk by combining scientific knowledge with regulatory information, to develop solutions that are innovative, compliant and pragmatic. We inspire our customers to maximise the potential for wellbeing of their property occupants, with financial and environmental sustainability. QED’s services include inspections, sampling and performance-rating of properties for office, retail, healthcare, education and industrial. Customers increasingly engage with us via our online services. 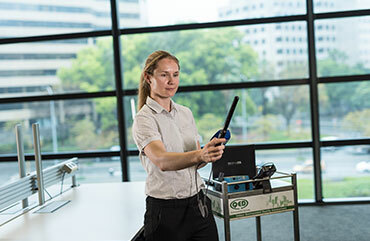 QED is the first and only organisation in Australia to hold such accreditation for Indoor Air Quality inspections and NABERS Indoor Environment Base Building ratings. Michael has three decades experience in business. He joined QED in 2015 to lead the management team, seeing an opportunity to position the firm for long term growth by aligning fulfilment of QED’s people with innovation and customer requirements in built environment. Following years of experience as an environmental engineer and hydrologist, Joe joined QED in 2001 with a passion for promoting the importance of indoor environment to the health, wellbeing and productivity of building occupants. He provides technical direction to all QED staff, and leads the development of advanced services. Joining in 1996, Ryan played an integral part in building the trusted reputation that QED has today. He manages all the firm’s field activities across the country, in office, retail, healthcare and education ensuring superior service is delivered with integrity and technical excellence. Chris combines his capacity for problem solving with a strong technical knowledge of built environment performance. He joined QED in 2008 and leads the firm’s chemical management and building rating practices, being an accredited NABERS and CBD assessor. Joining QED in 2006, Matthew applied his asset management experience to developing air quality risk and HVAC conformance programmes for national office portfolios and large healthcare facilities. He leads the firm’s indoor air quality practice, specialising in project monitoring and telemetry. Sarah has years of experience in medical facilities where she specialised in microbiology and infection control, drawing on her postgraduate studies in medical microbiology. She leads QED’s infection control practice which includes hospital air quality, mould investigations and legionella risk management. Dave brings to QED a breadth of asbestos management experience in manufacturing, mining and shipping. He leads the firm’s hazardous materials practice and has arguably the highest accreditations available - Certified Competent Person (asbestos) British Occupational Hygiene Society and Lead & Practical Assessor UK Accreditation Service.